ML | What Does ML Mean? 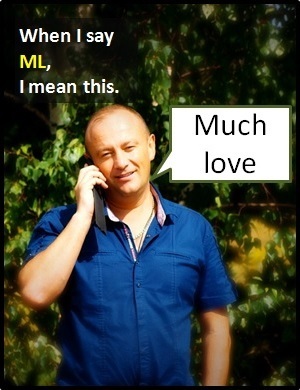 ML means "Much Love". ML is an abbreviation of the phrase "With Much Love". It is commonly used to close an informal conversation between close friends or family members. The use of ML in business comminications would not usually be appropriate. ML is a way of closing a conversation. Helen: I managed to cancel the order for you. Brian: That's great news, thank you. ML. Dawn: I had a great time last night. Lisa: Me too, let's do it again soon. ML. I'll be in touch. ML is an abbreviation of the sign-off phrase "With much love". ML is an�initialism abbreviation. Technically, this means it is pronounced using its individual letters (i.e., "Em El"), but it is not spoken using its letters. Before the digital era, we might have said something like "With much love" or "Lots of love" instead of using ML.